Winter Dogs Second edition is now available!!! 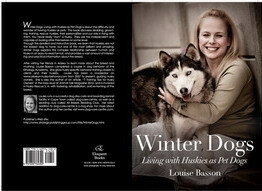 The book discusses sledding, training, grooming, rescue Huskies, their personalities and our role living with them. You never really "own" a Husky. They are too independent and capable of looking after themselves on some level. Through instructive book we learn that Huskies are not the easiest dog to have, but one of the most brilliant and amazing. Winter Dogs explains this complex relationship between human and Husky in a easy-to-read format, and provides interesting and practical information about the breed. Below you can safely order and purchase this book online through to check out. Or use the contact form provided below for any queries. Please leave time for shipping of 1-6 weeks. 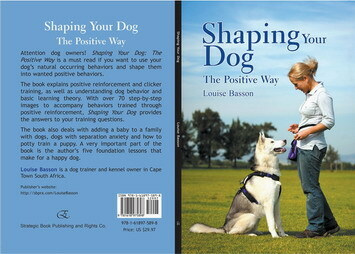 Shaping Your Dog explains dog behavior and how they learn. 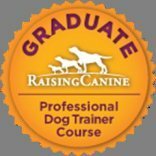 I also write about training including, clicker training, shaping, targeting all through positive reinforcement and give step by step training advice on manners training including things like, recall, sit, stay, lead walking and the leave cue along with a few more behaviors accompanied with over 70 color illustrations. I also explain how to help a dog with separation anxiety, having dogs with kids in the same household and my 5 foundation lessons needed for a calm and balanced dog household.